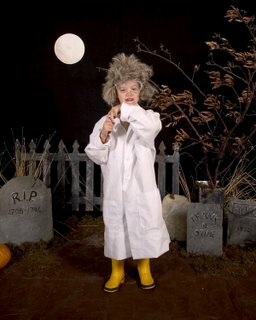 Inspired by my son's Halloween costume, I came up with a SMokin' Mad Scientist. This was done quickly in Painter...the sketch and all. I don't like the pencil line's texture. I need to find a better tool for the line work if I'm going to sketch in Painter. But I also just need more practice in it overall. Thanks to illustration friday...I'm getting some more time in the program. Last Halloween, my photographer husband Rhett began the tradition of taking free halloween portraits for any neighbor or friend etc. who stopped by. 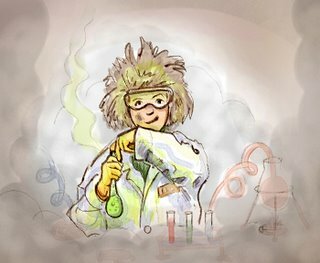 This year, I got to design the set. So, I got out the cardboard and cut out a fence and tombstones and quickly painted them. I also stopped by an empty field and picked up a dead tree branch. The leaves were still attached and had the odd appearance of being blown in the wind. A black backdrop, brown tarp, and a paper moon later, we had the set. Here's a photo of my mad scientist son doing a test shot for my husband. It was fun.